Man and Van Knightsbridge offers a wide range of professional property removals and goods delivery services to all private and business customers in SW1 area (and surrounding districts). We are here to assist with a wide spectrum of relocation requirements ranging from basic home removal to full scale commercial moving projects. We have the technical capacity, manpower and expertise to organise and handle all stages of any job thus providing our customers with a seamless, fully comprehensive man and van service. We understand that people’s service needs vary greatly so we offer bespoke removal and delivery solutions designed to wrap around individual requirements and budget. In order to provide households and businesses in SW1 area with exceptional quality removal and delivery services, we work with the right people for the job. Our removal teams are very efficient and handle all aspects of the service from A to Z. As you probably know by now we are more than capable and willing to deal with any property relocation or goods delivery schedule you can throw at us. Below are just the basic services we have on offer. For a full list of what we can do for you – please speak to our consultants. For extra convenience and more value for money consider one or more of our side services. We offer professional tenancy cleaning, specialised packing and storage solutions, furniture assembly / disassembly and licensed junk removals (residential & commercial). Full property clearances can also be arranged for. We have a fleet of modern Lorries and Lutons, which we clean at the end of each day. We have equipped our removal vehicles with highly accurate navigational systems that allows real-time GPS tracking. The cargo sections of our vans and trucks are fitted with safety belts that prevent transit related accidents. You should not that aside of providing top-notch man and van services in Knightsbridge, SW1, we also offer affordable van hire options. Knightsbridge is one of the better known districts of the British capital. 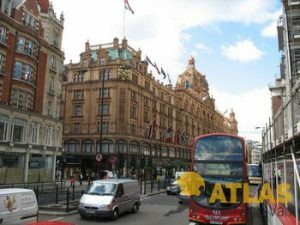 Situated in the heart of London, Knightsbridge is designated as one of two international retail and commerce centres. In contents and layout the district is both commercial and residential, with many properties serving both purposes. Knightsbridge is swanky, expensive and glitzy. There are also some banks and other financial institutions which cater to the needs of wealthy residents and guests of one of London’s prime districts. The Victoria and Albert Museum is unequivocally the most famous landmarks in Knightsbridge, SW1. Founded during the mid-19th century, the gallery is dedicated to the history and evolution of decorative arts and design. It is visited by almost 3.5 million people on a yearly basis, which makes it the sixth most visited museum in the United Kingdom and the eleventh most visited in the world. The gallery has a collection of over 2.2 million items that are displays in 145 galleries. Count on us and our able crew of movers to bring you fine man and van assistance. With our company in Knightsbridge you will receive masterful van hire and you will not end up spending a fortune. Additionally we are a completely licensed and a fully insured van relocation firm. Our vehicles are well-maintained and are exceptionally safe. Even the most fragile items are delivered safely around the SW1 area. Knightsbridge is officially in West London but it is located exceptionally close to The City of London in the borough of Westminster. We simply cannot skip mentioning Harrods as one of the most remarkable buildings in the area. It is a huge department store but a luxury one as well. What is most impressive about it is the façade, however. Knightsbridge also houses the well-known Hyde Park Barracks with the 33 storey tower nearby. It was constructed by Sir Basil Spence.